Email cover letter and CV to: Marilyn Hill, Director of Physician Services mhill@beebehealthcare.org Beebe Medical Group Administration 1515 Savannah Road, Suite 102 Lewes, DE 19958 www.beebehealthcare.org www.beebemedicalgroup.org Beebe Healthcare is a non-smoking and fragrance free system. 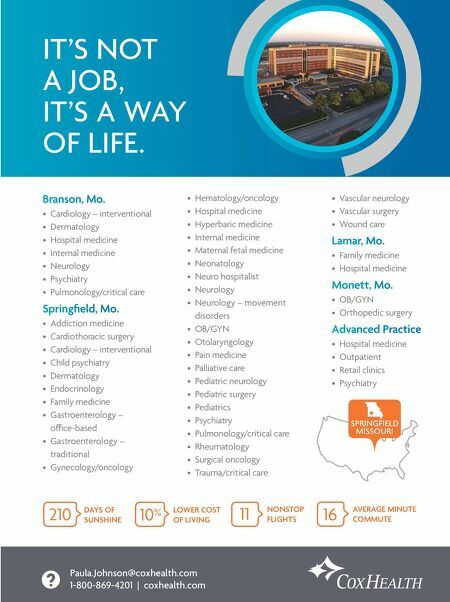 See Beebe Healthcare Physician Opportunities Ready to move to the beach? Beebe Healthcare is a progressive, not-for-profit community health system with a 210-bed hospital, solid growth and a $180,000,000 expansion underway. We're located in the family-friendly coastal area where the Atlantic Ocean meets the Delaware Bay, and where you'll find an optimum work-life balance, offering a challenging, rewarding medical career and an active lifestyle. Beebe is committed to attracting and retaining top clinical talent. Beebe Healthcare. Rich in History, Focused on the Present, with an Eye to the Future. 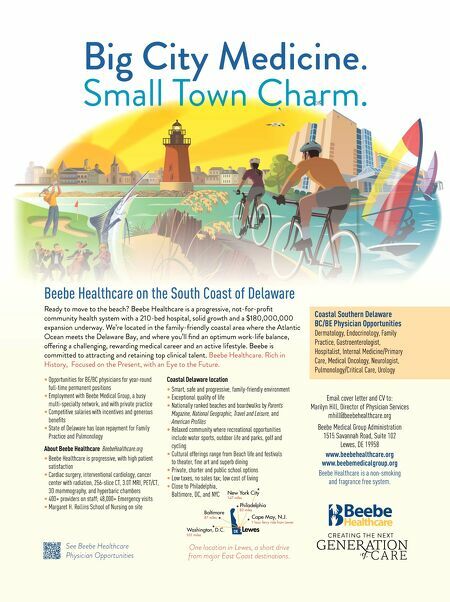 • Opportunities for BE/BC physicians for year-round full-time permanent positions • Employment with Beebe Medical Group, a busy multi-specialty network, and with private practice • Competitive salaries with incentives and generous benefits • State of Delaware has loan repayment for Family Practice and Pulmonology About Beebe Healthcare BeebeHealthcare.org • Beebe Healthcare is progressive, with high patient satisfaction • Cardiac surgery, interventional cardiology, cancer center with radiation, 256-slice CT, 3.0T MRI, PET/CT, 3D mammography, and hyperbaric chambers • 400+ providers on staff; 48,000+ Emergency visits • Margaret H. Rollins School of Nursing on site Coastal Delaware location • Smart, safe and progressive, family-friendly environment • Exceptional quality of life • Nationally ranked beaches and boardwalks by Parents Magazine, National Geographic, Travel and Leisure, and American Profiles • Relaxed community where recreational opportunities include water sports, outdoor life and parks, golf and cycling • Cultural offerings range from Beach life and festivals to theater, fine art and superb dining • Private, charter and public school options • Low taxes, no sales tax; low cost of living • Close to Philadelphia, Baltimore, DC, and NYC Coastal Southern Delaware BC/BE Physician Opportunities Dermatology, Endocrinology, Family Practice, Gastroenterologist, Hospitalist, Internal Medicine/Primary Care, Medical Oncology, Neurologist, Pulmonology/Critical Care, Urology Beebe Healthcare on the South Coast of Delaware Big City Medicine. Small Town Charm. One location in Lewes, a short drive from major East Coast destinations.